Woman gather at a local market area to celebrate the victory of Ivory Coast's President Alassane Ouattara after elections in Abidjan, Oct. 28, 2015. Ivorian president Alassane Ouattara has won a second term in office. He received 83 percent of votes Sunday according to official results announced overnight. His win doesn't come as a surprise and Ivorians are reveling in the calm. Cars honking, people rushing to work, vendors selling coffee by the side of the road -- the streets of Abidjan look just like any other day just a few hours after results were announced. And this simple fact is for Tonian Amalaman a reason to rejoice. He said, "it doesn't matter who won. I am happy to be able to walk down the street and see that there is no violence." A nearby opposition supporter agreed. "I am not a supporter of Ouattara," she said. "But I must admit that I'm happy because I was fearing the announcement of the result. I didn't want any violence. But everything went well, and I hope it will last because you need peace if you want a country to develop. President Ouattara won a landslide victory. Second place candidate, Pascal Affi N'Guessan, got just nine percent of the vote. Ivory Coast’s President Alassane Ouattara arrives inside a polling station to cast his ballot during elections in Abidjan, Oct. 25, 2015. In 2010 and 2011, more than 3000 people were killed in post-election violence when incumbent president Laurent Gbagbo refused to accept defeat. 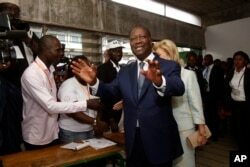 Internationally accepted results showed Ouattara had won the November 2010 vote. Gbagbo is awaiting trial at the Hague for crimes against humanity but tensions live on. "Behind the scenes of a planned electoral hold-up" read one local newspaper headline Wednesday morning. Several opposition candidates pulled out of this race before, and even after voting, while others called for a boycott. Gbagbo supporter Roland N'Drin said he didn't vote and claimed the 54 percent turnout announced by the electoral commission was false. He said elections were calm because the real democrats stayed home. He said the people of Ivory Coast knew Ouattara is imposter. Ouattara's first term was focused on getting Ivory Coast's economy back on track and Ivorians say there is more work to be done. Sékoné Arouna said, "that is what we are asking the president, especially jobs for the youth. There is too much unemployment"
Local and international election observers say that despite minor incidents Sunday's poll was free and fair.